A couple of weeks ago the beer store where I buy most of my beer from had the Weltenburger Kloster beers on Friday night tasting. I've got one of each of the four beers on tasting and will be trying to review them over the next few weeks, starting with this Munich Dunkel Lager on a cold Melbourne night. For those non-beer nerds out there, a Munich Dunkel Lager should have the smooth complex flavours of a stout without the thickness or stickyness. This brewery is the oldest abbey brewery in the world and one of the oldest breweries full-stop, beginning production in 1050 just 10 years after Weihenstephaner! This is a great style of beer for cold nights, hopefully this is a good example of the style. 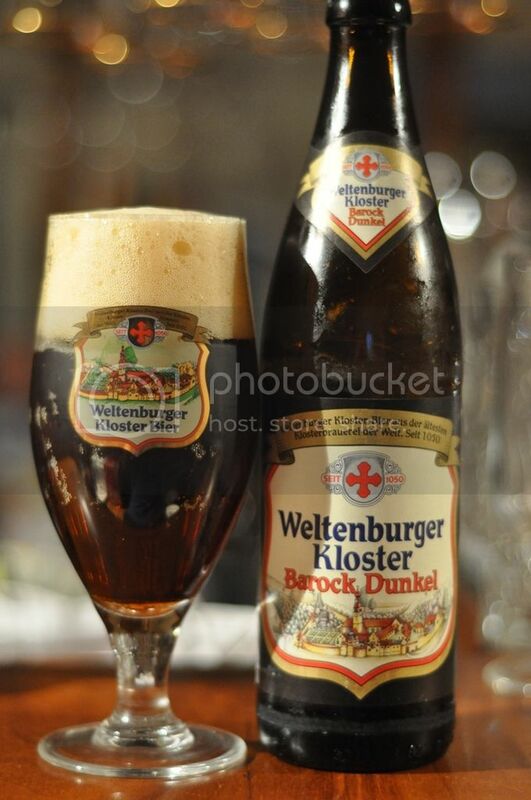 Weltenburger Kloster's Munich Dunkel Lager pours a deep ruby colour with a large but airy head. The colour is brilliant for the style, and despite the very airy nature of the head it's size is impressive. Not only does the head have size to it, it also has excellent retention and laces the glass well. It's an impressive looking beer, hopefully it can taste just as good. The nose is impressive on this beer. The malts are lightly roasted and don't give off a typically roasted smell, it's more like well baked bread. There are chocolate and woody elements to the nose as well as the faintest hint of grassy hops. I'm also picking up some dark fruit smells (cherry? ), which makes the beer feel warmer. If that makes sense to you good, if not I can't work out a better way to explain it so you may just need to try this one... Onto the tasting! This dark beer is simply delicious and is going to appeal to both lovers of dark beers and lagers. The flavours are exceptional without one element overpowering the others. The beer starts with a chocolatey taste before a slightly sweet malty taste permeates the palate. The grassy hops are stronger than the smell indicated but they flit in and out, and don't provide a lasting bitterness.The finish is a beautiful smokey flavour combined with some more sweet malts. It just goes down so nicely! As Munich Dunkel Lagers go this one from Weltenburger Kloster is a really nice one. It's a style I think I'm going to have to drink more of, as almost everyone I have I really enjoy. This is a very drinkable beer, it may not have the most complex flavours but this I think lends itself to being almost sessionable. Not many dark beers are potential session beers, but if there is such a thing this would be a contender because of it's light mouthfeel and inoffensive flavours. Go out and try this one, its definitely one for the winter months!